Do race photos need to be so expensive? In a world of digital downloads it scarcely seems sane to pay around £70 to download a selection of photos – in many cases, this is more than the cost of entry to the race in the first place. The photos are well-taken, but they’re usually from the haggard last few miles. 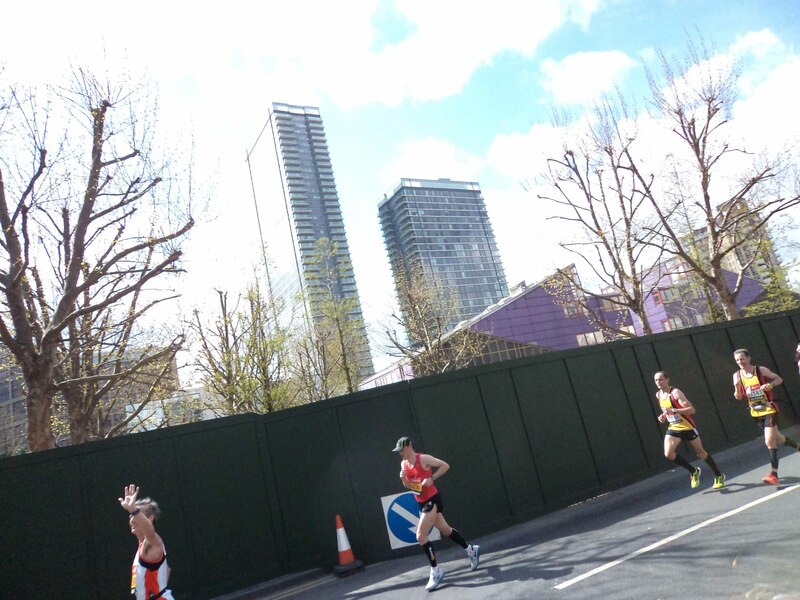 At the Virgin London Marathon I was lucky enough to have supporters with cameras around the Canary Wharf section, so I wanted to see how their photos compared with the premium options. First off, the premium photos taken by the pros. This has been reduced to a description for safety’s sake (see comment thread below!). So, you’ve got the London Eye in the background, it’s taken on a corner so I’m leaning in, and it’s nicely framed. However, at around mile 18 I spotted my mum, step dad and girlfriend and – since I was feeling good – offered up a hearty wave and smile for the cameras before getting back to the task at hand. Possibly cheesy, yes, but still a nice memento. You wait for your runner for ages and then they’re there and gone in a matter of seconds – not great for side-line snappers. And so this would seem to prove the value of that digital download, packed full of however many photos the cameras managed to take of you during the race. I expect there are thousands of people with similar side-line photos because spectators can only really guess when their runner is likely to rush past in amongst the tens of thousands of other runners. But if you look closer, it’s a pretty decent photo of Warwick Gooch (23748, who finished in 2:56:36) and John D Bigg (31141, who finished in 2:58:16). What looks like a castaway photo of me suddenly becomes a perfectly good race photo of them, two runners from the same club having a good day out. Hang on a cotton-picking moment, the entrepreneurial side of my brain said… What if spectators could upload their photos to an online service that would scan and identify the bib numbers in each photo? Could you attach that to an ecommerce system, so runners can pay a small amount to download photos that feature them, spectators can get paid for their pictures and race directors can get a cut? This way everyone’s rewarded and costs are kept right down. I ran the photo through some OCR software, which is designed to turn images into editable text. Perhaps unsurprisingly, the software wasn’t able to pull out the letters (there’s probably some super-accurate software used for number-plate recognition, which could do the job). However, the numbers can be read by humans. This makes the recognition task the preserve of something like Amazon’s Mechanical Turk, which was designed to outsource small and relatively simple tasks, precisely like this. Which begs the question of how simple it would be to set up a crowd-sourced competitor to make race photos that much more affordable – which presumably would mean more runners would be likely to buy them. Do you have a load of photos of random strangers from races you’ve run? Would you be interested in seeing other people’s photos of you from big races? I totally agree, I was amazed at the prices they wanted to charge for the photos! I like the idea of crowd sourcing, my only concern would be the influx of amateur photographers trying to snap as many runners as possible to earn a few quid. Lets face it, in 30 mins at a good vantage point with a decent SLR you could snap hundreds of runners which could equate to quite a bit of cash even if it were only a couple of quid each. I don’t have a problem with that as such, after all if I can get a decent photo of me for a fraction of the “professional” price I’m happy, but I would have a problem if my family and friends couldn’t see me due to amateur photographer’s clogging the side lines. That’s an interesting point… On the plus side, it might help provide a cost-effective alternative to the professionals for smaller races. A couple of years back, I ran the inaugural F1 Chicken Run at Brackley. The race director had equipped a couple of marshals with cameras and a couple of days after the event they were selling photos for a couple of pounds each. Since funds from races usually get ploughed back into the running community, I felt that this was quite a good move. I guess the question of quality has to come in somewhere, though. People shooting on decent SLRs is one thing, but you’re likely to see quite a few shaky shots if people use camera phones! I know what you mean about the costs, I’ve been stunned that anyone would buy them at that price! Captive audience, I suppose. I was pleasantly surprised to find that the firm employed for Brighton charged less than £30 for the entire set in 4 digital formats. I did cough up, first one and all that. As for the crowd sourced photos, I think this site may be along the lines of what you’re on about: Spectator-photos.com. It seems to allow spectators to upload shots, tag them with race numbers and allows runners to search by race and bib number. Interface is a bit rubbish, but the idea’s good. I’ve not come across that site before – it’s very similar to the kind of thing I was thinking of. I had a quick search on it for my race number from Sunday and came out with no results, so I guess that highlights one of the problems of random snaps! If the photos are good, less than £30 sounds like a reasonable price. I know that Marathonfoto (race photographer of VLM) donate a portion of their profits from sales to charity, but I don’t understand why they charge just shy of £70 for a full set of digital images. I’m lucky in that there are quite a few photos of me, but last year there was at least one runner who was being asked to pay that much for just one photo! Another website I’d not heard of before today! Spectakers.com has got a nice interface and looks like someone’s put some effort into it. Brilliant idea, Lewis. The scenario RelentlessRunner describes is actually fine. Amateur photographers are very unlikely to clog the spectator area (I mean, even a 10k race theoretically offers 20k of spectator space…), but they would help boost the service. It seems like Spectator-photos hasn’t really nailed it. The sky’s the limit, really, if you think beyond running to triathlon, sailing, canoeing and any other public-participation events. All that’s needed is some kind of identifier (i.e. race number). Go for it! ps Your site could offer some basic tips to anyone getting involved in sports photography. Notice, for example, how the professional photographer at the London marathon had positioned himself to catch runners coming off the corner. The faster runners – your good self, to name but one – lean into the corner, creating a diagonal axis within the photo. A staple of sports photography. (I appreciate this particular point isn’t an option for friends and family as they need a clear stretch in order to identify their runner…) Anyway, just thinking round the idea! I like the idea of a guide for amateur sports photography! A few simple rule to click by… I think in the case above there’s something to be said for being prepared for when your runner comes round the corner. This is a great idea. On the Marathon Talk site a chap posted a link to his own site ( http://eksaye.com/marathon/ ) where he took 000s of photos on the day, very nicely taken shots but the album is impenetrably large with no way of assigning numbers. A crowd-sourced task of upload and identify seems workable too. If you don’t mind, I’d like to speak to our innovation research team here at Dare ( http://www.thisisdare.com ) to see if there’s anything we can do to get something like this designed and built. Please drop me a line directly and I’ll see what our tech guys say. Cheers John. You got mail! As a person who runs a sports photography company (sussexsportphotograph.com) I can attest that £70 is too much for a collection of images. Which is one of the reasons I started my company. It’s good to read such a controlled thread on the price of photos, usually they dissolve into crass swearing and expletives over a few quid. Onto the generalised point about crowdsourcing – yes it’s possible and has been done. I know one of my major competitor companies has a server based crowd sourced solution for indexing their images. (I have checked his entry at companies house and he made a loss last year). However Both OCR and crowd sourced solutions end up leaving out of focus images in the album – neither of which present a suitable product to the end user. Screen resolution preview is the sticking point – good enough for making a purchasing decision is exactly the same as good enough to steal a copy. For example – the copyrighted and watermarked image you are showing on this very thread is there illegally – it’s good enough to show what you want, but you have stolen it from Marathon Fotos – an american company who I believe don’t hang about when they find stolen images on the internet. If you had advertising on here – you could be done for using it commercially too – ahh I see you have – woops!. Be aware – Getty start at $2000 for every unlicensed use they find. Over 15% of visitors to my website try to take a copy from the google analytics reporting, despite most methods being disabled. Every copy taken instead of the cheapest purchase possible (currently £5.99) is the equivalent of a tin of soup being taken from me. It is essentially death by a thousand paper-cuts from blind people. If only 1% of visitors instead of shoplifting chose to purchase their images I could probably halve my prices and wouldn’t be driving an X reg car. This despite us putting up over a million images for sale last year. The margins are very tight. I think generally there is a massive assumption that photography is cheap and free, and that photographs and images should be there for the taking. This is insane, and one company that tried to do this with crowdsourcing through a flickr app could only find themselves to go out and take photos for hours on end for free and rapildy shut down when they tried to commercialise it. And – Ali-baba isn’t as cheap as it seems when you start to look into it from the end-to-end view to serve images up to them. For a typical half marathon – each photographer costs about £100 to £150 pounds for the day. Indexing and cataloguing the images, editing out the ones of you not looking your best – can be done at about 800 per hour, which needs corei7 workstations, good graphic cards and large screens, fast servers, good network and good staff. These are not cheap and even at minimum wages you can have over 40,000 images to go through from a medium sized half marathon. So that’s 50 manhours just cataloguing – which by the way you have to have done for the next day unless you want to miss out on sales for taking too much time. So that’s at least 5 workstations if you want it done in 10 hours, on a Sunday, into the night, which isn’t normal weekday pay rates. Assuming no problems. and that’s just the obvious costs. So, firstly – obviously you can do the maths, work out the volumes needed to purchase photos from a race (the %age who do – really honestly work it out based on what you and your friends have historically purchased) and then figure out if they are priced too high or too low. Also consider the time taken to get the images to you – and work out based on an average salary of £24k how that works out per item. As a runner myself (ok only just sub 1:50 for a half, I was better at hurdling) I also don’t want to get stung for a large amount of money either for my race photos, but they do have to be put into perspective of the massages, fuel, entry fees, accomodation and kit that all goes into the cost of entering a race. At around £12 for a memory that will last a lifetime (if you backup or print it properly) is very good value – and no we don’t expect you to buy every image ever from every race ! Finally – beware “kwality” – Marathon-photos downloads are not full size quality by any means (only 3 megapixels which is half that required for an A4 print), and they also ensure all their photographers take images at the smallest possible settings on their cameras – exactly because they crowdsource all their indexing back to their New Zealand offices and the local students to do the data entry. As for tips for amateurs : get your shutter speed above 1/500th of a second and use as low an aperture as possible. And get low, don’t stand up. ANd then – context context context – but that’s a general photography tip, not just sport. In summary – TIME is the main ingredient that makes your photos cost what they do, and the next time your stood at the side of a marathon for 6 hours in the rain and cold you can rest assured the photographers are earning their bread and don’t eat caviar. Thanks for such a detailed and clear response. You raise some very interesting points about the economics of race photography. In fact, the weekend just gone I ran at the Oxford Town & Gown, where Sussex Sport Photography were doing the honours, and since there were around 2500 runners, each of whom must have had a good few photos (I think there were about 12 of me or so), all uploaded within a day or so of the event, there’s a phenomenal amount of work that goes on behind the scenes. I’ve run at a few events that have been photographed by your company and so subscribe to the news feed. What’s remarkable – especially given the issues you outline in your comment – is that the Town & Gown was only one event in about three or four that you were covering in the same day. That’s a lot of photographs to take and process in a very short window of opportunity. The more I’ve looked into this, the more the issue of quality has come to prominence. Firstly there’s the composition of the photograph, then there’s the focus, then there’s the resolution and technical quality. And that’s before you even get on to the tagging of race numbers in photos. I think I’m right in saying (and please correct me if I’m wrong) that there are some races where race photographs are free for runners (presumably the race director pays a certain amount up front for this, which is included in the race registration fee). If this is the case, I think as a runner it sounds like the ideal situation – you guys get guaranteed payment for the work involved in taking and tagging the photos, and runners get a very individual memento from the race. Many thanks for the Order Lewis – you looked strong at the finish there. Experience wise I had 8 years and a manufacturing and design engineer and about 8 years in international marketing before this world, and my business partner had about 16 years in logistics, planning and international cost effectiveness – so that knowledge all goes into the fast turnaround of what we do after events. Speed is of the essence as lost time = lost orders as people move on afterwards. Often the slowest part is getting the data from the photographers after the race – suffice to say it has evolved in the past ten years as technology has changed. USB 3.0, gigabit and Solid state data drives are a godsend. I await decent fibre broadband upload speeds with relish. You’ve highlighted the main issues of the business in terms of the images themselves – quality, focus, context, relevance and then speed to market. Passion for the subject also helps rather a lot – you have to like what your looking at – otherwise it shows in the resulting images. Yes – we do cover events where we are paid (who actually pays is part of the black art of event budgeting, entry fees and sponsorship) to provide unlimited downloads, and statistically the download rates are huge. It certainly beats the possible customer engagement through traditional means (i.e. plastic bottles, flyers in a bag) and the reach – because people post them on social media – is much much greater. Yes – it does lower the financial risk for us – but we do have to make sure our best team are on these events because then quality and indeed %age coverage of competitors is paramount. The free download is the same size as the £5.99 product we sell at the moment. We find event organisers looking to differentiate their events and trying to develop a deeper engagement with runners in their race series are the ones going for the free download package and the clever ones are using it to engage their sponsors on a deeper level too. Good luck with the training and I hope the scottish marathons work out well for you. Thanks again Anthony. I hope you and Sussex Sport Photography have a successful race season. Interesting blog, stumbled across it the other day wondering about this very thing. I ran the Watford 10k two weeks ago, and Sussex Sport Photography were doing the photos. I went on the site and liked them (and was surprised to find how many they had of me). Though was rather surprised at the cost. I caved in the end and bought the set (£40) anyway, as i’m still at that stage of being impressed with how I look etc when running, novelty value, having only started last July. It is nice to have a memory of something you have worked hard for and are proud of. It was my second 10k and I ran 42.41. 56th place or something. I won’t complain about it (and it’s also very interesting to read the point of view from their side, so thanks for that Anthony). I won’t be ordering them for every race, as it does get expensive, but i’m glad you offer the service all the same, and the quality was good! Liking the blog Lewis, I haven’t had a chance to read much of it, but it’s just what i’ve been looking for (was considering starting my own). I’m also from the Oxfordshire area, living in Didcot at the moment, and doing lots of 10k’s over the coming months. Chiltern Chase the next. Glad you like the blog. That’s a great time for the Watford 10k – I ran it last year and it’s certainly not the flattest of races! Should be good preparation for the Chiltern Chase, which is also hilly, but with some great scenery. It’s interesting that you mention losing interest in seeing the photos from races as you get more experienced at racing. I suspect that runners actually stay equally interested (or at least, I have) because race photography is often the only way to check your running style. The number of races I’ve run where I thought I finished with a flourish, only to look in photos like a broken man heel-striking all the way to the finish line… It’s certainly helped me to identify areas for improvement. I used to live in Abingdon, so you’ll see quite a few reports from races in the area on the site. If you’re looking for a PB course, try the Andy Reading 10k near Bicester towards the end of the year, and if you don’t mind hills give the Frieth Hilly 10k a go come the winter. And if you fancy reviewing any of the races as a guest post, let me know. Good luck with the other races! 7Oaks Tri Club use Sussex Sport Photography for our events and give them away as free downloads. It is a cost to us that is not the biggest expense but is still big enough to make us ensure we get good value. I have done a number of running and triathlon events and nowadays only buy the pics when i do a ‘really’ special event (I have pics from my Ironman races that i am really glad i have) but most of my day in day out half marathons for example, I dont buy. Hence why the photography companies work to small margins. and so on until you get bored. By the way, this list didn’t include the fun stuff like medals. BUT when you choose your races, see what gives you a real memory of the race. In my mind, this is usually something that i want to keep or reuse. So for example my Ironman Canada medal is one of the best medals i have from 30 years of running and 15 years of triathlon. The pictures i have from my last triathlon were also really good. A free photo download that you get from a race can be put on your social media feeds, if you use them, your club website or just your screen saver. Or print them out 100 times and use them as Christmas cards. As a race, we like seeing people use their free downloads that we pay for. I think the model will have to go this way in future if we want Anthony and his team to sit on the side of a road for 5-6 hours at a time going forward. Thanks for your comment. A couple of years ago Runner’s World had an interesting article about the costs and effort involved in organising a race. There’s an awful lot that goes into it, and since there are so many races with relatively small fields that manage to keep entry fees below the £20 mark. I imagine that you can effectively triple those elements for a triathlon. Races are arranged as business events to raise funds for various causes. Race directors need to make sure their race is attractive to competitors in order to get enough entries to cover their costs. I think Anthony’s point about the added value of ‘free’ race photography as part of the entry fee is an interesting one. It’s a competitive advantage, and if I had to choose between two races on the same day – one with, say, a free t-shirt and one with free photography – I’d go for the one offering photography every time. I think runners are generally keen to share race photos, and I would imagine this could help add a bit of free publicity to build interest in the event for the next year. I guess the key to making the most of it would be to ensure the course passes suitably striking scenery that can be used as a backdrop for race photographers. I just stumbled upon your article and the idea you suggest is one I set up back in 2008 – RacePix.com. It’s gone through many iterations since then but the premise has always remained the same. Photographers of all abilities can upload their photos to their own portals and RacePix.com aggregates them together to display them all in one place. Users can now chose to add their photos from Flickr, Facebook, Zenfolio and Picasa to race galleries on RacePix.com. Another feature that’s available is for people browsing the pictures to assign bib numbers to those that appear in the races.Visitors can then search by bib number and if they’re lucky they’ll find themselves. New photographers are always welcome to add their photos. A few years back (2010 or 2011) a group of photographers who had photos of the London marathon shared their photos from that race. If you ever have any photos from race and are looking for a place to showcase them then drop me a mail.